Enough about me, though. Let’s talk about Miss Saigon. I have wanted to watch Miss Saigon from day 1. When it first ran it was only performed in Drury Lane in London miles and miles away … beyond my powers to watch. The desire to watch it only increased with the samples we were given such as Lea Salonga and Simon Bowman’s performance of Sun and Moon and The Last Night of the World. 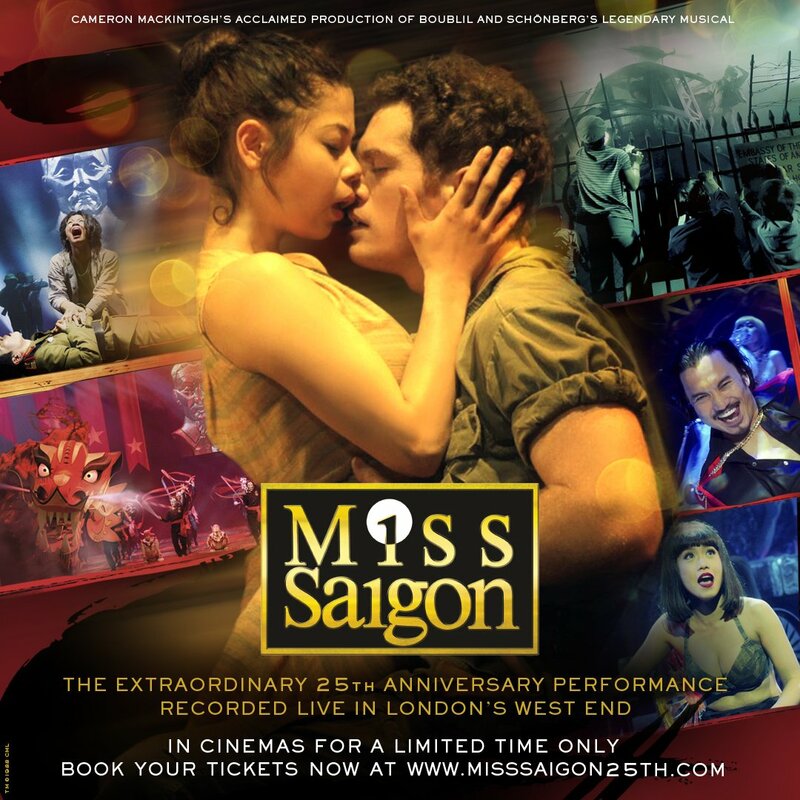 And after watching those and other videos and listening to the soundtrack the desire to watch Miss Saigon became even stronger and with the passing of the years my desire has not waned. Later it finally made its way here to the Philippines (with Lea Salonga as Kim) and I really, REALLY wanted to watch but just couldn’t afford the tickets. And I thought once again … “I hope they come up with a movie version of this so I could watch it”. And after 25 years of waiting the movie in my mind is finally the movie I can watch. I rushed to SM Megamall from my class to meet my friend, Kasuy, and catch Miss Saigon in Megamall’s Cinema 5 before the show started at 5:05pm. Since I took an Uberpool instead of UberX the trip took longer than expected but I made it! Huffing and puffing, I made it with a few minutes to spare before the movie curtains rolled up. The cramps, the mild asthma attack … it was all worth it. I was transfixed on the screen and singing in my head with all the songs as I finally got to watch MISS SAIGON. The cast was different and their were a few adjustments to the lyrics but the story remained the same. The 25th anniversary performance of Miss Saigon met my expectations and then some. Miss Saigon is a retelling of the story of Madame Butterfly which was set in feudal Japan. It tackles, instead, the trials of war during the Vietnam war and revolves around the characters Kim and Chris. I was so involved in the story that I often found myself chuckling in amusement or choking in sadness with my tears streaming down my cheeks. I was awed at the cinematography, the lighting, the set design. I was equally awed at the choreography, the singing … and suffice it to say I was awed by the acting. Being the super fan that I am I couldn’t help but compare the actors with the original cast, after all, Lea Salonga and Simon Bowman are a tough act to follow. In my personal opinion Eva Noblezada (who plays Kim) did an excellent job and sounded a lot like Lea back in the day. She has a very sweet voice and she acts like she isn’t acting, which made it easier for us to relate to her character. Every now and then I caught a glimpse of Kim’s Lea which for me was a good thing, because it meant that I focused more on the character and not on the actress. The phenomenal acting of Rachel Ann Go as Gigi came as no surprise. While part of us wished Isay Alvarez who was the the original actress in the role was in the cast, Rachel did not disappoint. As a matter of fact she was so good she made my arm hair stand on end. Jon Jon Briones as the Engineer did a bang up job and Jonathan Pryce would have been proud. His depiction of the role was definitely very Asian and, in my opinion, was more sleazy and playful. Each person who has played The Engineer have placed their own unique stamp to the role and Jon Jon has certainly made himself memorable to me. Was it better than Jonathan Pryce’s? I wouldn’t say that. I would, however, say, it is different … in a good way. As Jonathan Pryce even said in the song when Jon Jon asks “am I good?” and he responded, “yeah, you learned it from me.” Cheeky! Lol! After the 2nd intermission the screens starts to brighten and we see the silhouette of Kim, the same pose she had when the play started. But this time when she raised her head and removed her hat we (the audience) saw … Lea. The gasps, the applause, the joy! I, will confess that I had hoped she would appear and the show did not disappoint. After she sings a duet with Rachel Ann Go … The Movie In My Mind, which brought the house down. The last song of the night was by Jonathan Pryce as The Engineer singing The American Dream. Halfway through the song Jon Jon joins him and from the back in a car enters Alain Boublil, Claude-Michel Schonberg, and Cameron MackIntosh. If you would like to catch it you can buy your tickets at smcinema.com or at the ticket counters of selected SM theaters. When I say it is a limited run, I mean it. You can only catch this phenomenal movie today, November 12, and tomorrow, November 13, 2016. Still unsure if you should watch or not? Maybe this trailer will convince you.